Entry filed under: AAQI News, Quilting News. 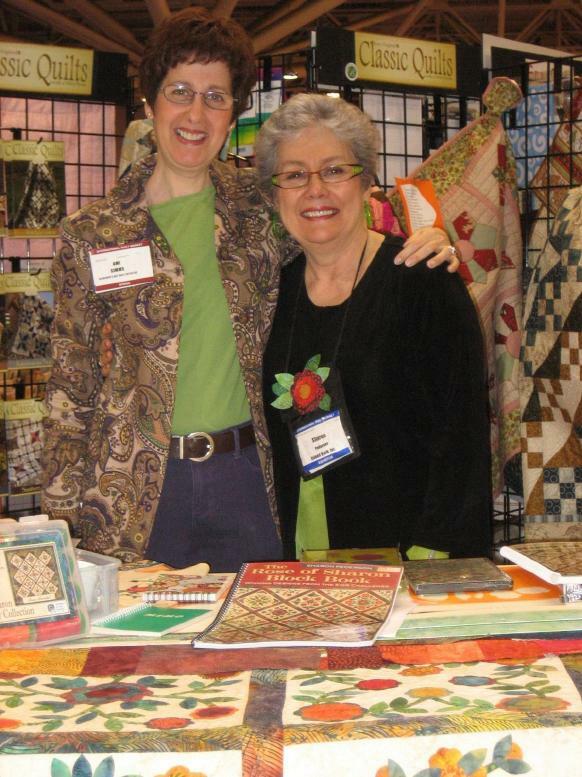 I saw the quilt (and Sharon & Elizabeth) at Quilt Market Ami. Island Batik’s booth was just near ours and there were always great crowds when Sharon was demonstrating in their booth. What a wonderful project and another way to support AAQI. beautiful quilt and heartwarming project. I’ve always wanted to make a Rose of Sharon quilt — sounds like this is the year! I can’t wait. This is absolutely wonderful. Awareness is the real battle and the Quilting community is helping. Madison must be really proud of his mommy. I hope you get a extra kiss from him for me. Fabulous collaborative effort ~ awesome quilt! Amazing … kudos to all involved!!! 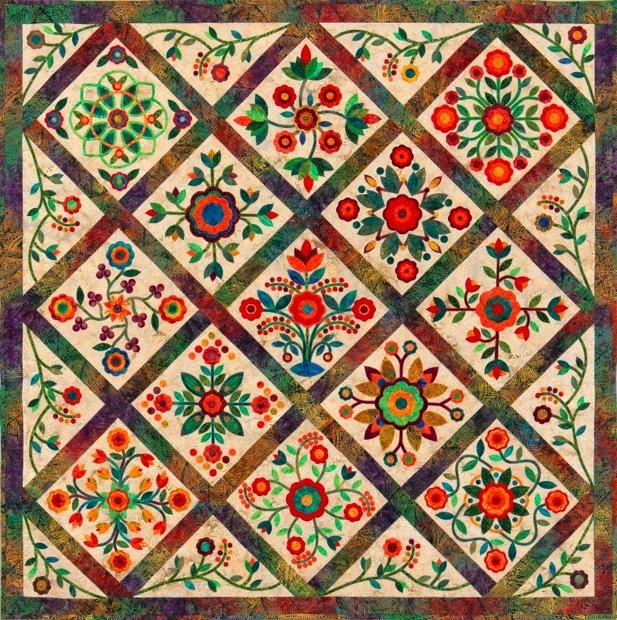 Simply Beautiful – I am anxious to see the applique and embroidery designs for this quilt. But how do you line up the quilt top and back so perfectly to make the quilting reversible!!?? To answer your question about how to line up the top and back – each block was appliqued, layered and quilted before being joined to the next block by a 2″ wide sashing strip. The beautiful back is the bobbin thread from quilting the appliqued design. 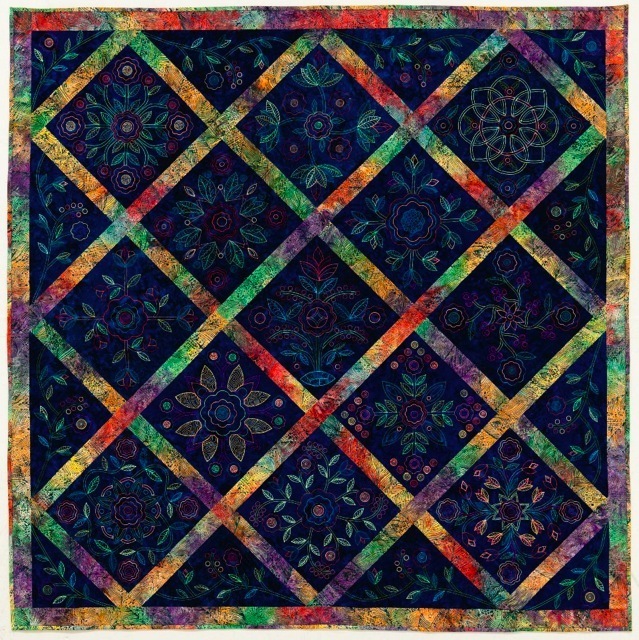 I am simply amazed at the beauty of this quilt. Will hand quilting work? Or does it need that bobbin thread to do it justice? That is a beautiful quilt! What talented caring people you associate with! What a beautiful, stunning quilt. I started BOM this month–January, 2011 and can’t wait to get started. What a wonderful challenge! Thanks for creating a wonderful winter project, and a keepsake for life!